The world has changed. More store closings were announced in 2017 and 2018 than any other time on record. Even household names like JC Penney, Sears and Toys ‘R’ Us have either gone bankrupt or are facing existential crisis. Amazon is disrupting retail. Online customers now expect FREE and FAST shipping in part because of the Amazon Prime Effect. According to the Wall Street Journal “Alongside life, liberty and the pursuit of happiness, you can now add another inalienable right: two-day shipping on practically everything.” But the reality for Sellers is, shipping is NOT free. It is the second biggest drain on their profits after inventory leading to record-low margins. The Moet team is on a mission to help online retailers improve their profit margin and competitiveness by re-writing the rules of conventional supply chain and fulfillment. 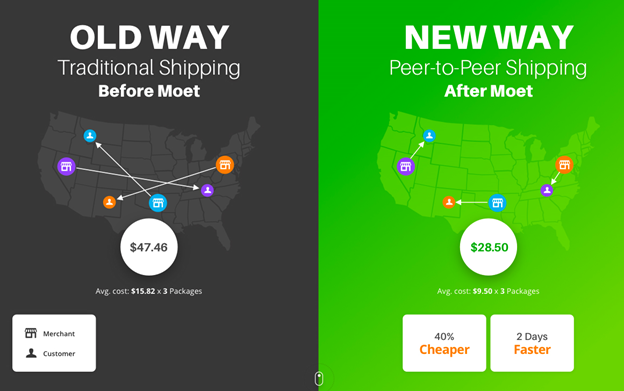 Moet is a disruptive Peer-to-Peer Shipping Network to enable Sellers to better compete in today’s world of ‘free and fast’ shipping. Moet uses Coopetition as the underlying business strategy to solve a problem that even the largest Sellers are struggling with. The goal of coopetition is to move the players to a plus-sum game, a scenario in which the end result is more profitable when the competitors work together. By leveraging Moet’s network-based optimization, FBM Sellers are able to ship packages cheaper, faster and smarter than anything else out there. Moet seamlessly integrates with each Seller’s Amazon Account, analyzing every incoming order from top-rated merchants. Moet’s patented solution identifies the Trusted Seller best suited to ship each order, based on the promised delivery date, precise shipping costs and the warehouse’s geographical location. Moet then sends the shipping labels directly to the Seller and automatically updates the tracking information in their Amazon account. That’s it! Merchants save each time Moet optimizes their order. Moet works seamlessly and anonymously; neither the customer nor Amazon are aware that Moet is making the delivery more efficient behind the scenes. And, since Moet matches Merchants based on their daily orders, there’s never any need for inventory or monetary settlement. Just print the shipping labels, ship and save… it’s that simple! Moet is NOT a drop-ship or a 3PL marketplace. Moet is a disruptive Peer to Peer shipping network that uses Co-opetition to save on shipping cost and to reduce delivery time. Because Moet only works with Trusted Sellers, merchants are sure to impress their customer and their bank account with every optimized order. Networks are everywhere – from face-to-face to social networks, telecom, study and business networks. Networks like Facebook, LinkedIn, Uber and Airbnb have disrupted traditional business models and our lives in ways never imagined ten years ago. And now, Moet is bringing the proven power of networks to ecommerce shipping and logistics to save merchants time, money and their carbon footprint. Moet’s patented system is built by ecommerce and logistics experts who have immersed themselves in this problem for over a decade with a mission to create a meaningful impact on the ecommerce world through technology. The result is a solution that’s not only clever and reliable but also very easy to use. Moet’s goal is to bring the future of supply chain and fulfillment to merchants of all sizes, enabling them to compete on a level playing field while helping the environment. For a limited time, select Amazon Sellers can get early access for free. Join the network and unleash the power of many. Simply book a meeting with a Moet expert at https://moet.io and we’ll take it from there.